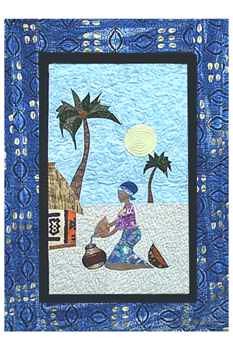 Mid Day Sun---Applique either by hand or using fusible web with a finishing satin stitch. Afternoon in a village with swaying palm trees and a grass thatched hut. Scraps for: water, head wrap, pots (inside and out), two tree prints, two trunk prints, 5x5 sun. Hut...10x10 roof, 5x5 walls, scrap for top and footing.